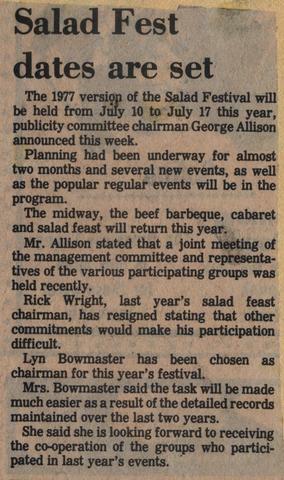 "The 1977 version of the Salad Festival will be held from July 10 to July 17 this year, publicity committee chairman George Allison announced this week. Planning had been underway for almost two months and several new events, as well as the popular regular events will be in the program. The midway, the beef barbeque, cabaret and salad feast will return this year. Mr. Allison stated that a joint meeting of the management committee and representatives of the various participating groups was held recently. 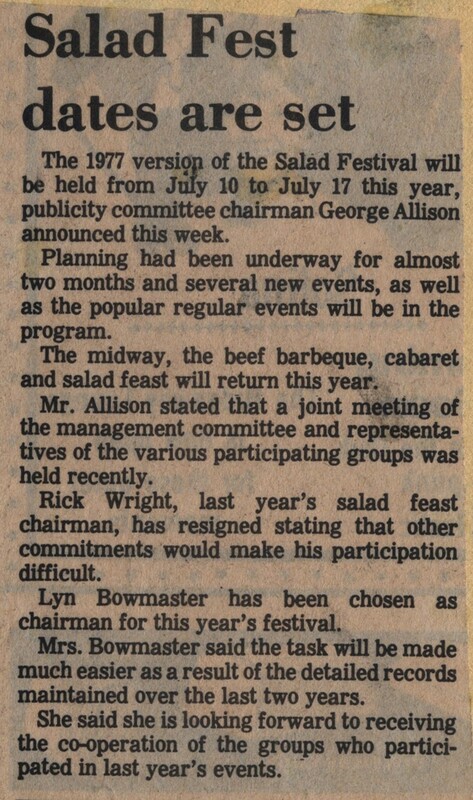 Rick Wright, last year's salad feast chairman, has resigned stating that other commitments would make his participation difficult. Lyn Bowmaster has been chosen as chairman for this year's festival. Mrs. Bowmaster said the task will be made much easier as a result of the detailed records maintained over the last two years. She said she is looking forward to receiving the co-operation of the groups who participated in last year's events."